During the NC Gold Rush, Rowan County was located in the heart of the Carolina Gold Rush Territory. Its most famous town during those days was Gold Hill. Today, Rowan is more commonly associated with the town of Salisbury, which is known for delivering an "Authentic North Carolina Experience." Enjoy a nostalgic change of pace and step back in time as you stroll along the wood sidewalks of this restored nineteenth century gold mining boom town. With its first gold discovery in 1824, Gold Hill is considered one of today’s most charming, historic small towns in North Carolina. Home to a quaint shopping village, a 70-acre park with beautiful scenery, it is quite easy to get lost in time as you discover all there is to see here. We offer everything from unique shopping opportunities in the restored gold mining town, to wine tours at an award-winning vineyard and micro-brewery, hiking in the great outdoors, bluegrass music, gold history tours, antiques picking, ‘Down Home’ dining and more. 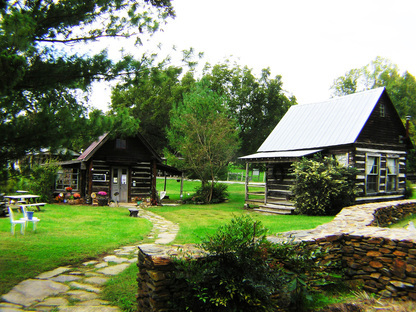 The 70-acre park is located at 735 St. Stephens Church Road, Gold Hill, North Carolina. It is privately owned by The Historic Gold Hill and Mines Foundation, Inc. and is open to the public seven days a week during daylight hours. The park facilities are available for private, formal/informal, banquets, corporate events, educational events, weddings, etc. and includes the famous Gold Hill Jail. Visitors will enjoy the great outdoors as the park offers several miles of hiking/biking/equestrian trails, a regulation size softball field and soccer fields, playground and picnic areas. We are pet friendly and kid friendly. 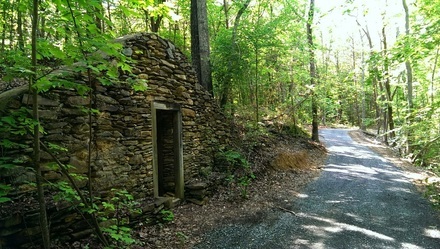 The Gold Hill Rail Trail takes in sites including the Powder House, Gold Hill Pond, Gold Hill Jail and Primitive Chilean Ore Mill. If cycling is your thing, bring along your mountain bike. 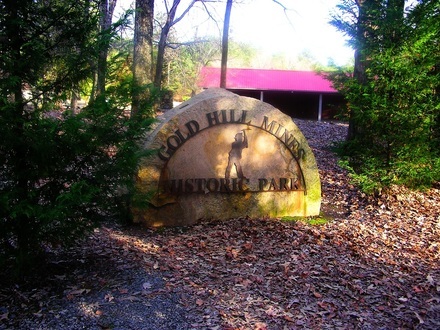 If you are looking for an interesting, educational and just plain fun day trip that you and the whole family will enjoy, take a look into visiting Gold Hill, North Carolina and exploring the historic Gold Hill Rail Trail! Gold Hill is located in Rowan County, North Carolina, USA. 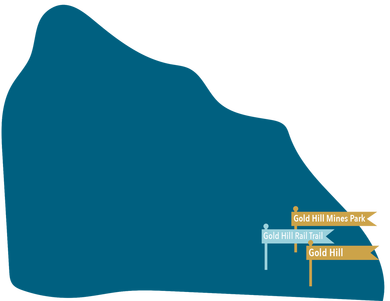 If you use Gold Hill as a hub, within a 100-mile radius a wheel forms to take in all the major population centers in the Piedmont and Western North Carolina areas. While this most delightful of small towns in North Carolina is thought to be “in the middle of nowhere,” it is actually “In the Middle of Everywhere."